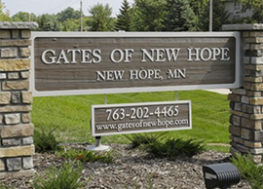 Welcome to the Gates of New Hope, a brand new luxury apartment community located in the heart of the Twin Cities. The Gates of New Hope has transformed the cities entrance into a stunning apartment community that appeals to individuals and families alike. If you have been looking for a new place to call home in a thriving northwest suburb, you have come to the right place. With 32 brand new apartment units, the Gates of New Hope offers premier amenities in an ideal location near Medicine Lake and minutes to downtown Minneapolis. Come see these apartments for yourself by scheduling an appointment today. The community of New Hope and its newest residential apartment complex are ready to welcome you with open arms. Congratulations! You have just found home.